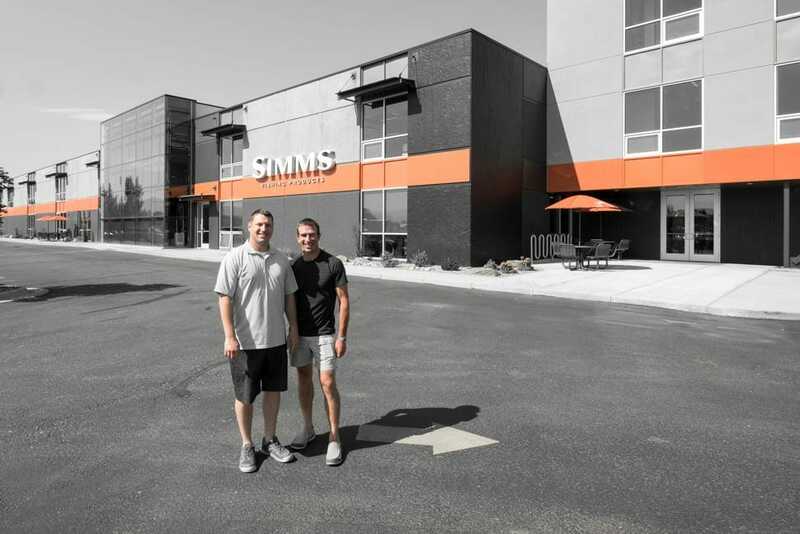 Simms Fishing Products company is based in Bozeman Montana, the most happening town we visited while travelling through Utah, Idaho, Montana and Wyoming. It’s a university town, with Montana State University based there, and like most university towns it has a vibrant and progressive feel to it. Add to that a plethora of outdoor options with mountains, rivers and wilderness at their doorstep, with Paradise Valley’s famous spring creeks just down the road and major rivers like mighty Yellowstone. New, attractive architecture abounds that integrates comfortably with the town’s historic rancher cowboy heritage. Five minutes out of town though is a brand new light industrial estate and as we round a corner it’s hard to miss what must be a jewel in the crown of Bozeman’s industry. The Simms building is conspicuous in its size with the grand presence of their glass offices at one end and the factory and warehouse at the other. At first impression, you could be excused for concluding that this a company where slick marketing is the priority. 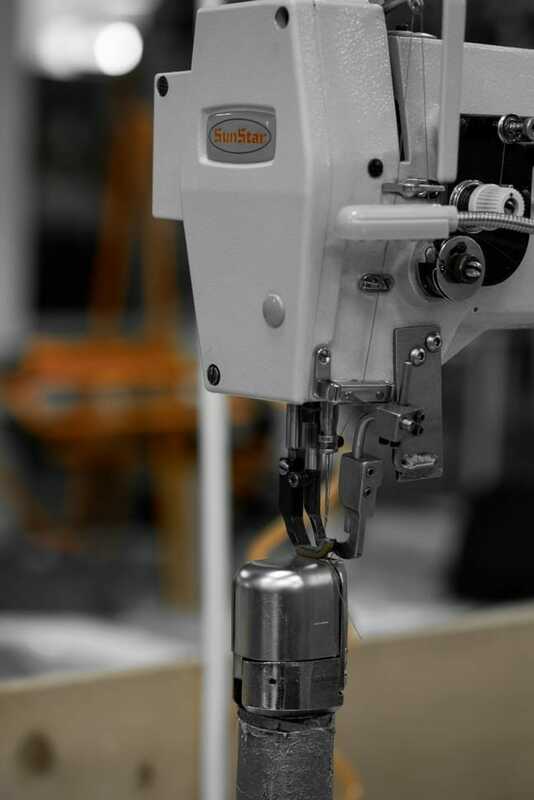 That is until we enter the factory through the repairs department, where customer’s well-loved waders are inspected and mended. 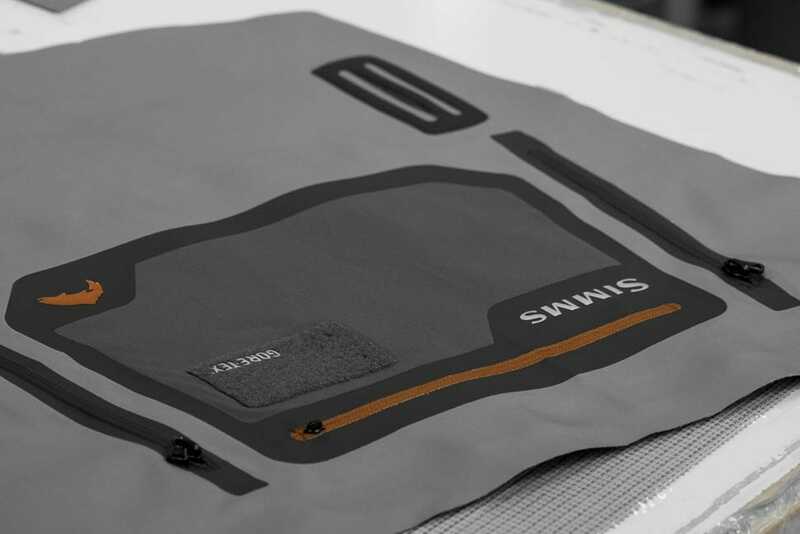 At first, it seems strange that they would walk us into a used wader area, rather than the glamour of new products, but it’s clear that Simms is serious about standing by their product, ensuring sustainable practices through a long functional product life. There are angled racks of laid out waders that look like they have well-fed people inside them. In fact, they are full of water being tested for leaks. We pick up some tips here that are useful for everyone. If you’re trying to find major holes in your waders, turn them inside out, fill them with water and check for visible leaks. For minor punctures, including ones that may not have gone through all layers, use a 70/30 water alcohol mix, this makes the Gore-Tex layer go darker so you can identify a potential weak spot. Either way you can then use an Aquaseal style of product to seal the hole (remember less is more). 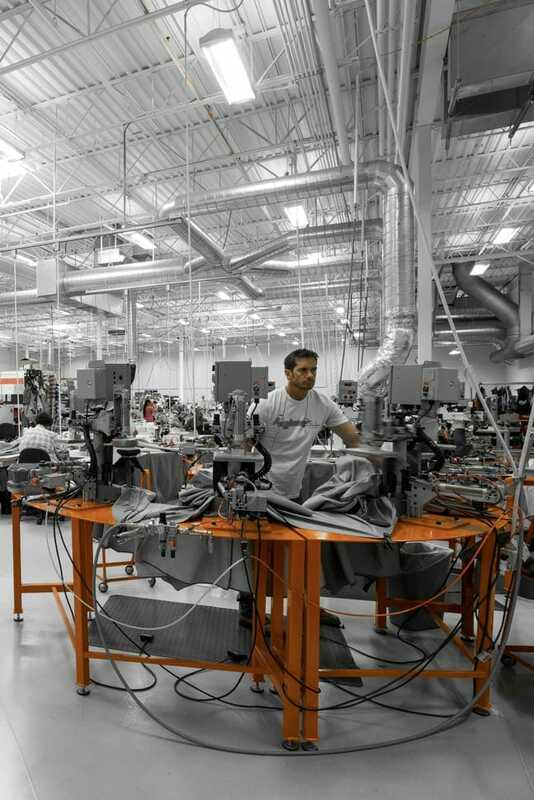 Entering the production area, we are immediately impressed by how clean and professional everything is. Everything has its place and there are stations for every wader component stretched across the vast, white floor of the warehouse. 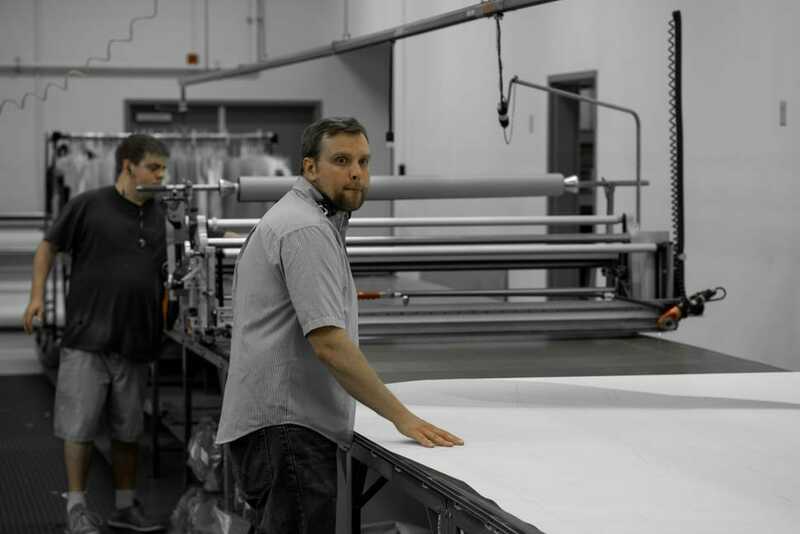 The wader production line itself starts at the pattern cutting table, where Paul, the cutter, and Matt talk us through the pattern layout. 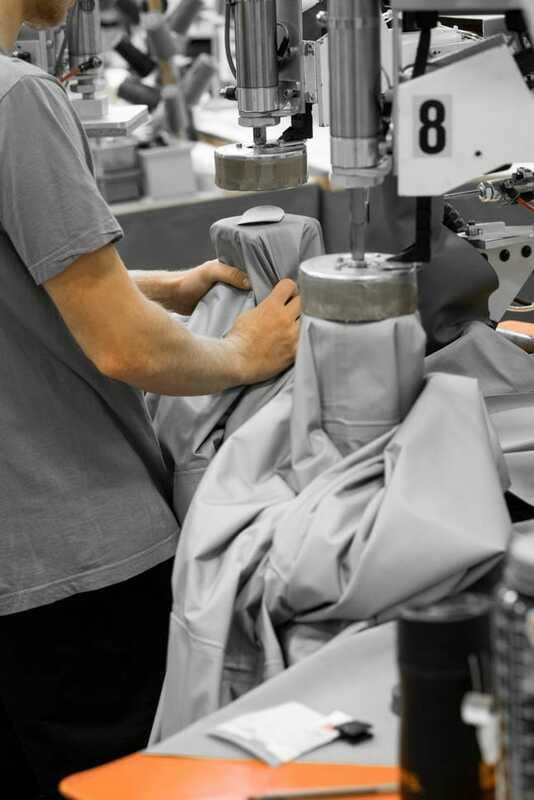 It’s a precise process, as Gore-Tex isn’t cheap and every inch of the fabric is carefully optimised with a mosaic of various wader pieces and then hand cut with a cutting disc. Some of the more intricate pieces are laser cut. Next we meet Sue, who makes every single gravel guard you see on Simms waders. Sue has been making gravel guards for 7 years and according to Matt all hell breaks loose if Sue takes a holiday! Well maybe not, but it is clear she is a highly valued member of the team. Pockets, zippers, and other components are all pre-assembled at this point to ensure everything is ready when the waders come together. I am reminded looking at these components, just how technical and well thought out Simms products are. 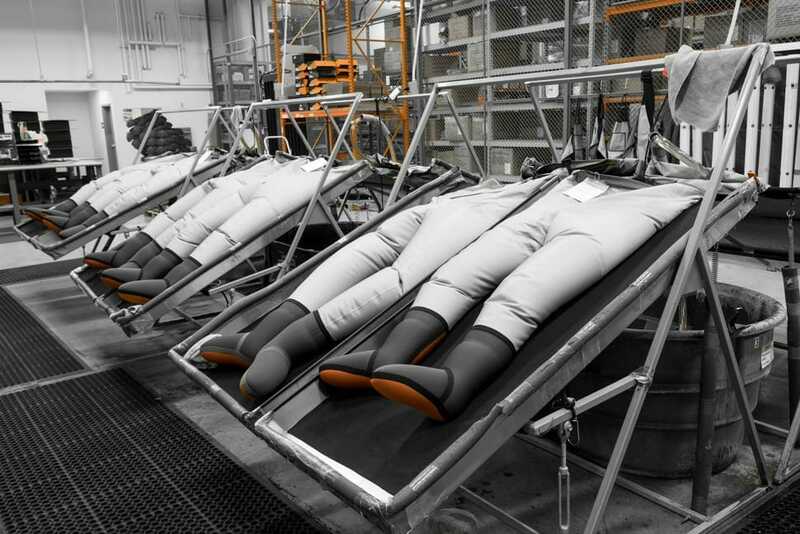 The components look like they are ready to be sewn into the latest NASA space suit. 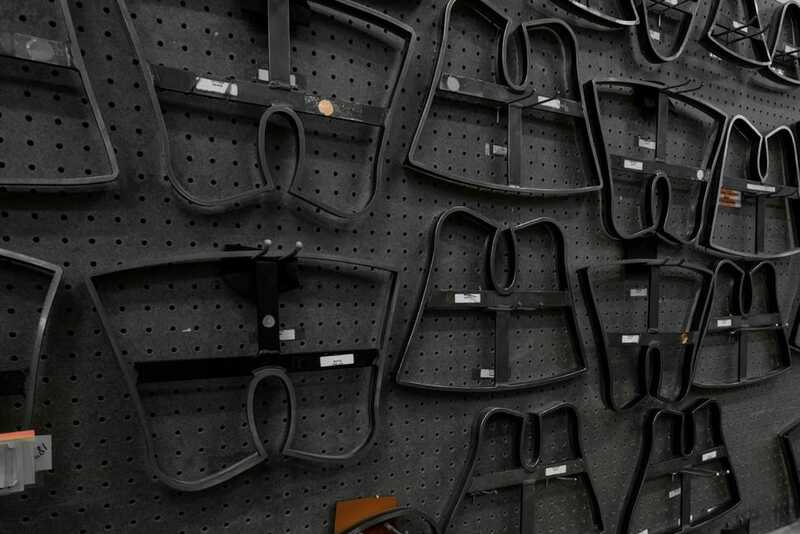 The wader components are all compiled into a job lot for each pair of waders by Jody, which then travel the rest of the line together being assembled across specialised stations for each element of construction. Simms’ leg seams run front and back which is unique, rather than inner/outer leg where they rub and perish. It’s performed by Becca on a bizarre looking stitching machine that looks like an upside down ice cream cone with a sewing machine on top. 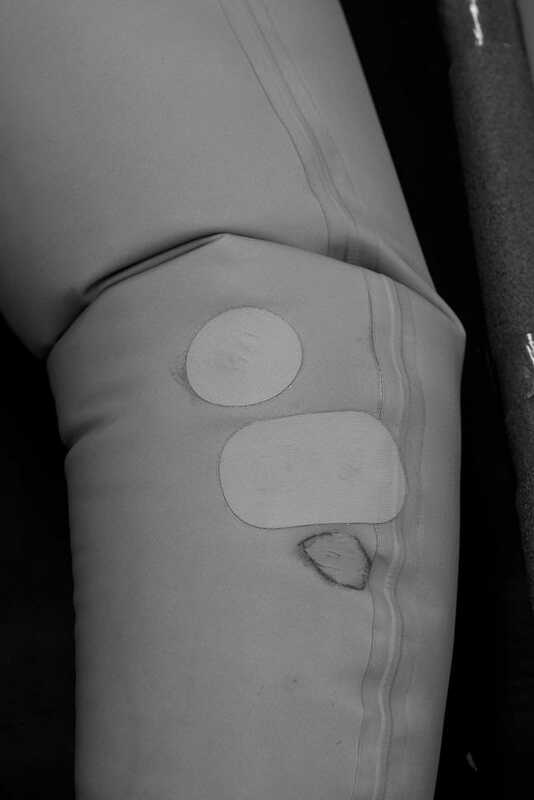 The seams are stitched together then over stitched to ensure their strength is optimised. Seams are then taped to ensure maximum integrity and water proofing. 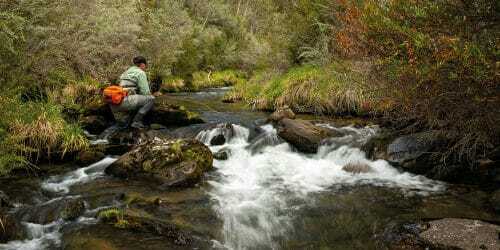 This is arguably one of the most important processes for the waders’ integrity. Jonny, the guy on the taping machine, takes great care in laying the tape down perfectly on machines that are licensed from Gore. 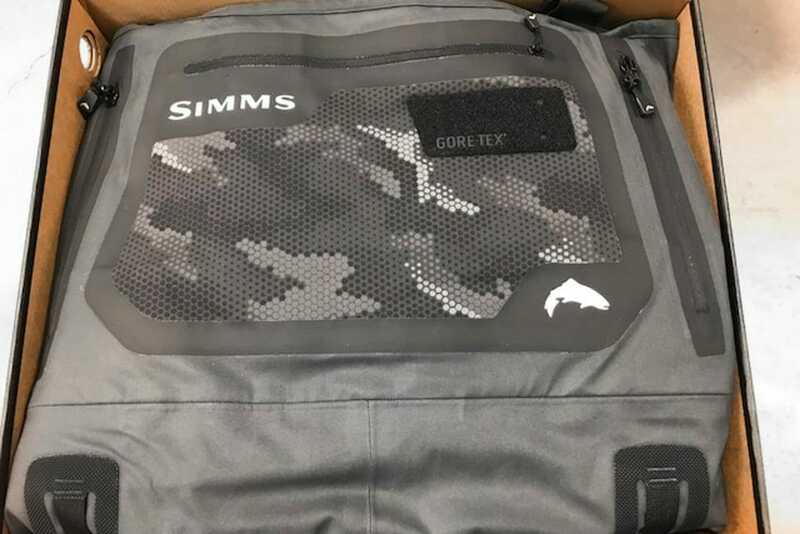 Simms must meet very specific production standards to be able to use Gore-Tex, and Gore regularly audit processes to ensure the waterproofing integrity of the product meet Gore’s strict standards. High stress points such as the crotch are then reinforced further using cross patches that add another layer of robustness to the seaming. These are galvanised to the wader using hot/cold pressing, ensuring the cross patches are well bonded in these critical areas. We move onto the feet area, a vastly different material to the wader fabric that has its own challenges in ensuring you don’t get wet. The stocking feet are cut with large metal dies, using separate patterns that articulate left and right foot in each size, a unique feature in Simms Matt tells us. The feet are glued edge to edge using the highest quality neoprene. We watch Sam hand press the seams together with well-honed dexterity before mechanically compressing the join at the next station. He offers to us to have a try, pointing to a small reject bin at his feet inferring the exacting standards we would be scrutinised under. We politely pass and leave it to the experts. 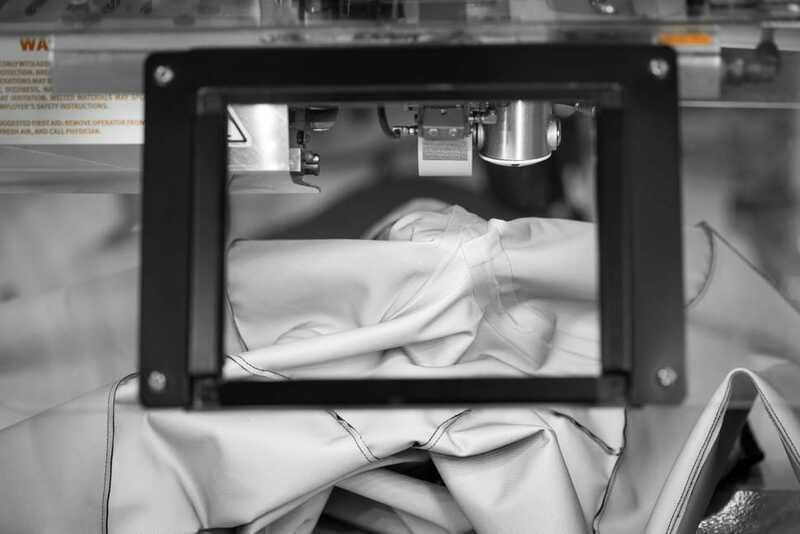 Joining the neoprene and wader fabric components together is one of the most challenging processes bringing two vastly different materials together in a uniform bond. Simms has developed their own proprietary method for this which we are understandably not at liberty to expand on, but having seen it we can say you can have a lot of confidence in the integrity of this union. At this point in the tour I stop and exclaim to Matt “what on earth are those, they are cool!” Next to the stocking foot production are pairs of boots lined up that look like they came straight from Bruce Wayne’s bat cave. 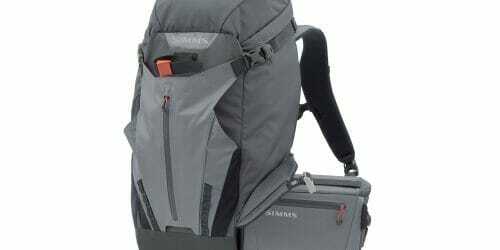 We agree that we will check in with Simms’ marketing department before publishing, as these are hot off the shelf. The latest in integrated boot foot design. In Australia and New Zealand we aren’t into boot foots much, except the ones people typically buy in cheap outdoor outlets. These are different and I mean WAY different! 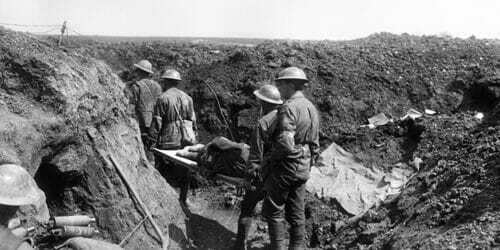 Simms used to use Bogs, you know the fancy gumboot mob for those who are familiar. 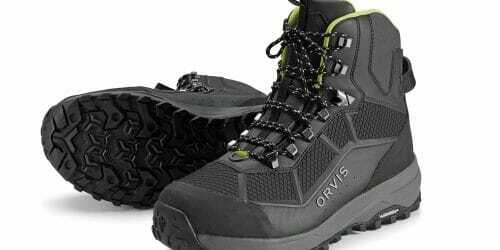 Simms has done away with ‘almost good enough’ and have developed their own boot now, taking it to a whole other level of technical appeal. They are called the Exstream and look and feel so comfortable, especially for the cold – think Eucumbene or Tongariro spawn runs, yet are as articulated as a G3 boot without the need to bend over and lace them up. I know what I am asking for Christmas along with a new cape and bat car. In Australia and New Zealand these are likely to be available as a custom order. 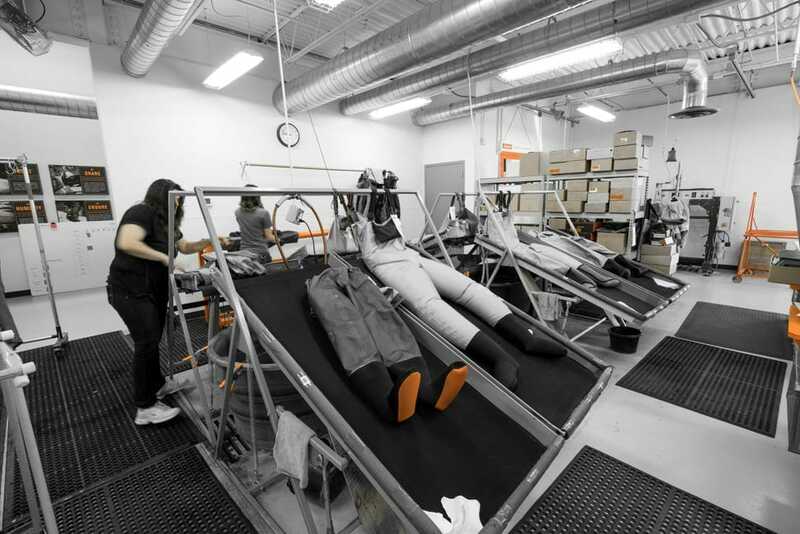 Every pair of waders that comes out of production is thoroughly tested. 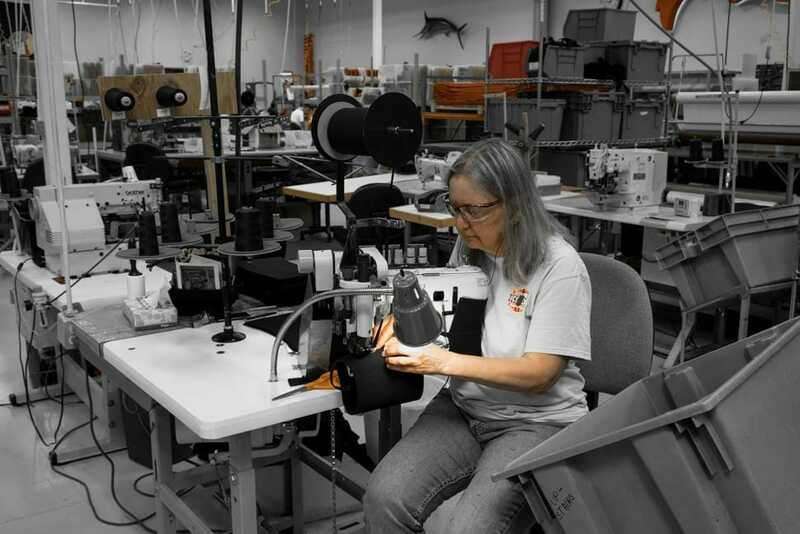 We watch as David uses similar methods to the repair department, filling waders with water and ensuring 100% integrity to the finished product, before being dried and boxed ready to be shipped to the next happy Simms customer. After that, it’s neatly into a box and off to the customer. 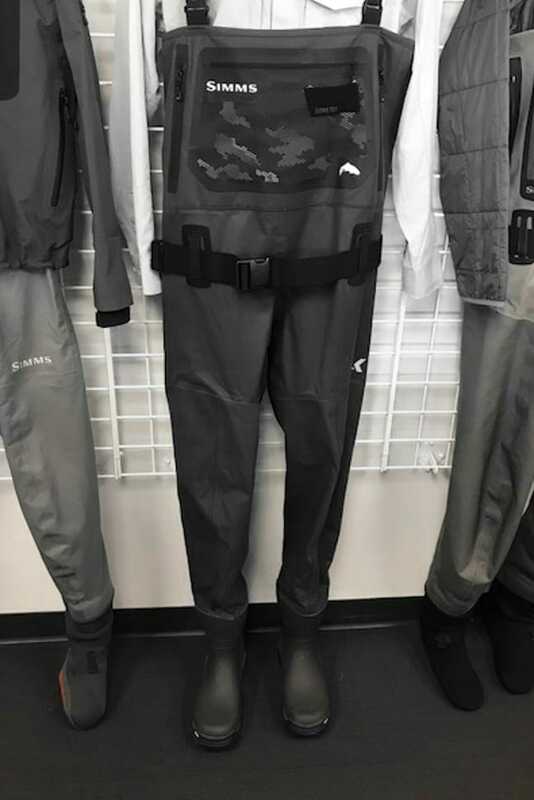 A brand new pair of waders finessed by a whole team of dedicated individuals in making better fishing products for us on the water. I ask Matt about prototyping in their research and development, as it strikes me that it probably all occurs right here where marketing, product development and production are all under the one roof. Matt confirms my guess highlighting that their production equipment is specific and technical. 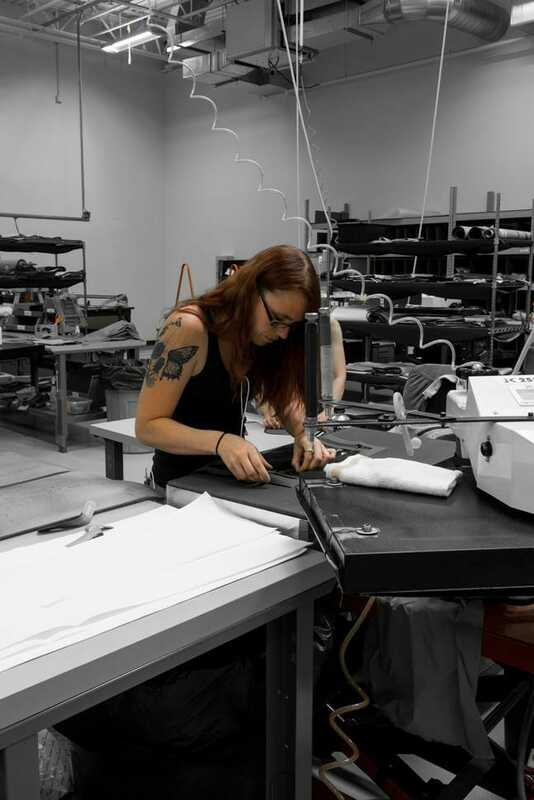 Rather than a separate facility, production staff actually stay on after their normal shift when required, to work with the design team on new innovations. This gives some insight into the collaborative vibe we experience on our visit. 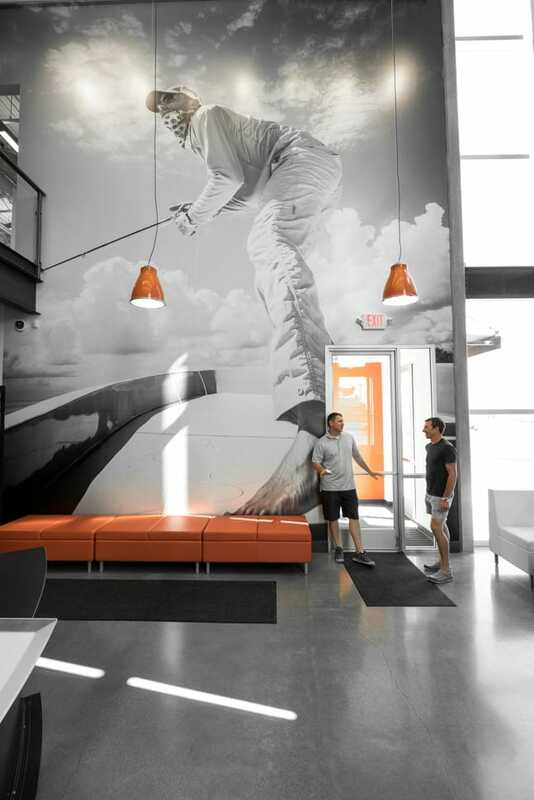 One innovation that takes us by surprise, is our final stop at Simms’ custom area. Matt has already shown us a picture of Mark, a 7’4” ex NBA player that they made a pair of custom waders for with size 18 feet. In fact, we learn that some elements of waders can be customised to order, so if you find you are from a smaller part of the gene pool talk to your local retailer about what options are available for an additional fee. 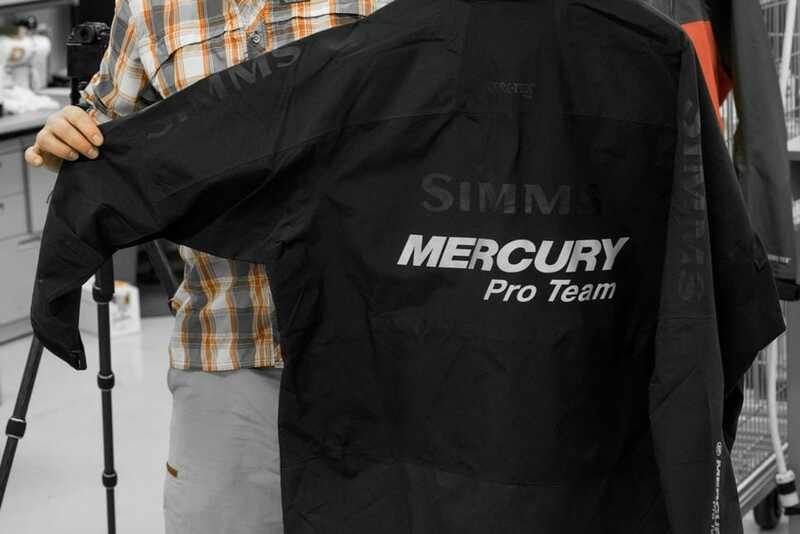 Simms has taken custom to another level recently and Rick and Craig talk us through the range of embroidery, sublimation and digital film options they now offer for customers to co-brand popular Simms garments such as their legendary quality caps and Solarflex sun shirts. 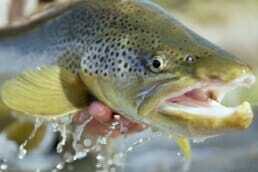 For example, Craig was doing Trout Unlimited shirts while we were there watching. 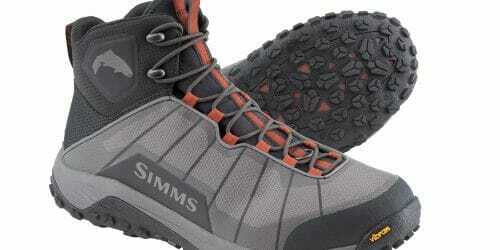 Reflecting on this step toward to the consumer with customisation highlights what a progressive company Simms is. 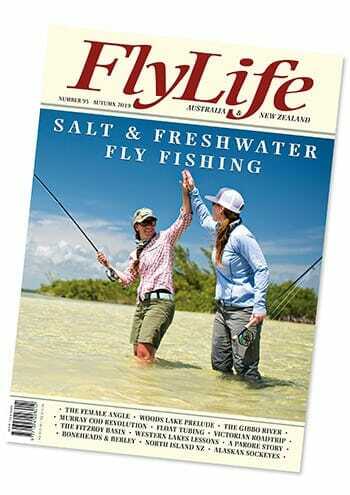 There is no stuffy tweed here, they are engaged with their customer and thinking about what a fly fisherman really needs and wants. They are innovative, and design products that are built for their purpose. 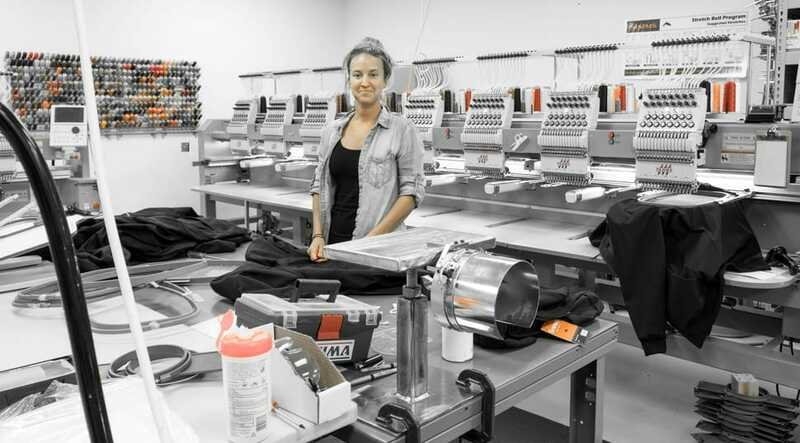 American home-grown manufacturing is alive and well at Simms, defying the trend of other collapsing or extinct industries like automotive, and flourishing despite the pressures of off-shoring and corporate consolidation. They are so successful, that they are about to outgrow their five-year-old ‘new’ facility and starting to discuss next steps to support their growth.